Wormholes have long been considered to exist only in the realms of science fiction, but some physicists believe the theoretical portals could be real, and there could be one relatively close by. 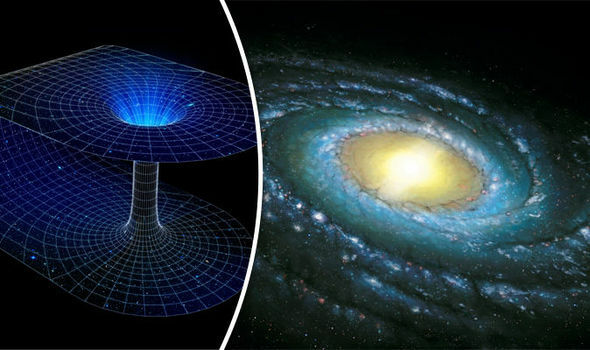 Wormholes, which were predicted by Einstein in his theory of General Relativity, are areas where space and time are bent to manipulate the distance. It would take a huge mass to produce the manipulation of spacetime, and no natural examples have ever been found. However, experts from the International School for Advanced Studies in Trieste, Italy, say they are possible, and could be hiding within dark matter inside the Milky Way. Professor Paulo Salucci, said: "If we combine the map of the dark matter in the Milky Way with the most recent Big Bang model to explain the universe, and we hypothesise the existence of space-time tunnels, what we get is that our galaxy could really contain one of these tunnels, and that the tunnel could even be the size of the galaxy itself. "But there's more. We could even travel through this tunnel, since, based on our calculations, it could be navigable. Just like the one we've all seen in the recent film ‘Interstellar'." Scientists had believed any wormholes which exist in the universe could simply be the size of a pin prick. However, the team of astrophysicists say the one in our galaxy could be big enough to fit a spaceship which could traverse the cosmos, as they would likely exist in other spiral galaxies. The paper published in the Annals of Physics, read: "Our result is very important because it confirms the possible existence of wormholes in most of the spiral galaxies. "Dark matter may supply the fuel for constructing and sustaining a wormhole. Hence, wormholes could be found in nature and our study may encourage scientists to seek observational evidence for wormholes in the galactic halo region."